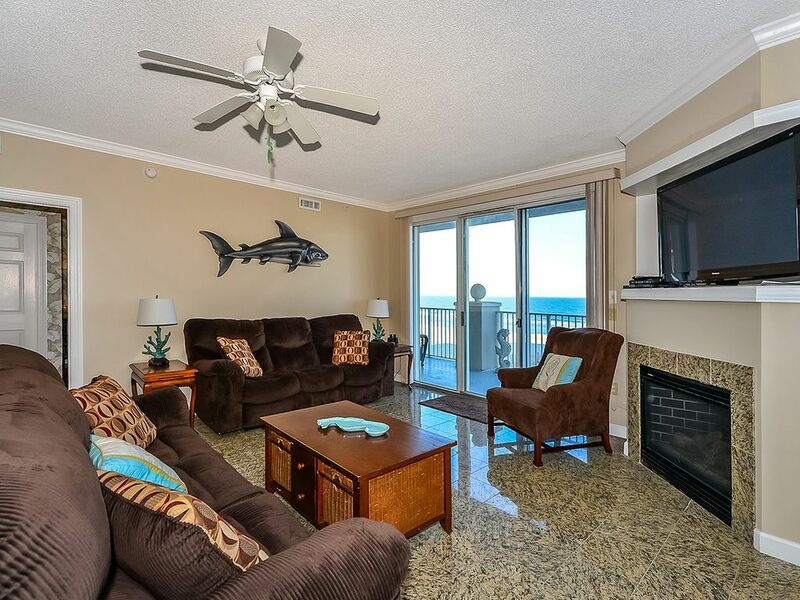 Stylish, upscale luxury 3 bedroom oceanfront condo with free WiFi and a breathtaking ocean view located downtown on the boardwalk and just steps to the beach! Oceans Edge 301 is a luxury beachfront condominium. This three-bedroom, two-bathroom condo has a furnished balcony overlooking the breathtaking Atlantic Ocean. This unit is the perfect place for you and your family to call home for a week! Oceans Edge 301 is one of Ocean City's finest vacation rentals. The spacious, yet homey living room is furnished with two couches, a recliner, a fireplace, and a television. The sliding balcony doors allow plenty of natural light to brighten the space. Right off the living room is a small dining area, perfect for cozy meals with the family. Also off the living room is a wet bar. Next to the dining area is the spacious, fully-stocked kitchen with a wide, granite counter top, just right for grabbing a quick bite. The master bedroom has a king-size bed, a personal television, a private bathroom, and access to the balcony. The master bathroom features a jacuzzi. The second bedroom has two pyramid beds and a personal television. The third bedroom has two double beds and a personal television. The second bathroom is located in the hallway. This property comfortably sleeps up to ten people, so bring the whole family! Unit 301 has the following amenities: central air conditioning, shops, restaurants, two parking spaces, an elevator, four TVs, one DVD player, cable TV, free WiFi, ceiling fans, full-size washer and dryer, refrigerator, microwave, coffee maker, toaster, stove, disposal, dishwasher, and an outdoor foot shower. Come stay at Oceans Edge and create wonderful memories to last you and your family a lifetime! So enjoyed our 4th of July vacation at Oceans Edge. The balcony was perfect spot to enjoy the fireworks. We would definitely stay again! We are so glad you enjoyed your stay! We'd absolutely love to have you back! The unit, itself, was fantastic, but the location was not so great! The worsr part of the location was the man who came with he microphone and guitar and sang the same 5 or 6 songs, over and over, every night, from around 7-12 or 1am! That was just simply annoying! Also, as we were packing our things to leave, we encountered 2 extremely rude women, who were either staying at, or cleaning out a unit....and they questioned us as to what unit we had stayed in! Not sure what that was exactly about, but definitely unnecessary! We are happy to see you enjoyed your stay. We're glad you liked the unit! We are sad to hear that the nightlife in Ocean City disturbed your stay. We hope to see you again, we would be happy to recommend some quieter units. We are not sure who spoke to you before you left, but they were not from Shoreline. We are sorry you had to deal with that while you were leaving. Hopefully, we will see you next year!